Damjan Kozole’s feature film "Nightlife" opened the Slovenian Film Festival (FSF) on Tuesday. On Wednesday, his latest short film, "Borders", was screened at FSF. "Borders" recently bagged the Jury Prize at the Dokudoc festival in Maribor. The aim of the 10-minute short film is to prompt the audience to reflect on one’s own humanity. Kozole recorded "Borders", a short film about an "exodus of biblical proportions", on 24 October, 2015. "When the wave of refugees reached Hungary, I knew it was only a matter of time before these people would spill over into Slovenia. I knew – as a director and as a person – that I had to react to these tragic events. I also had a hunch that "Borders" would be a sequel to "Spare Parts", a feature film I recorded at the exact same location 13 years ago. The only difference between these two films is that in my latest film, reality replaced fiction," said Kozole in Portorož where the Slovenian Film Festival is being held. Kozole and his cameraman Matjaž Mrak drove to the Slovenian-Croatian border a day before "Borders" was recorded. 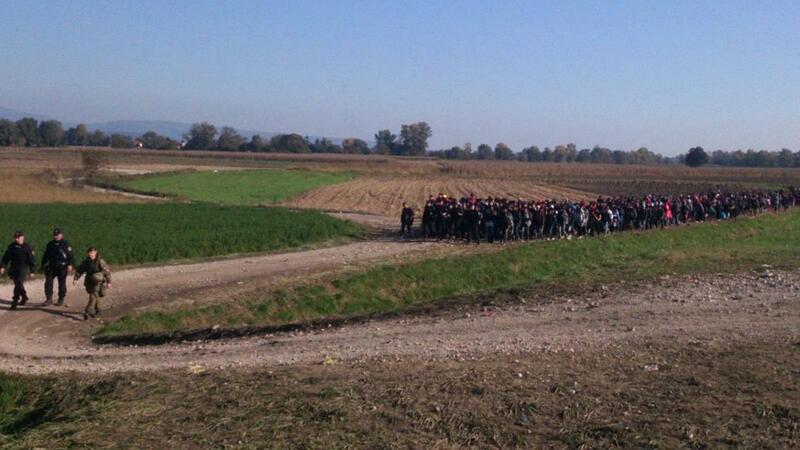 On 23 October, news broke that refugees were stuck in no man’s land between Slovenia and Croatia. "I was dumbfounded, I was faced with a moral dilemma. I didn’t know how to document their journey. It was already horrible as it was. Matjaž did record a few scenes and I played football with some refugee kids, but we didn’t record anything of use," said Kozole. Despite this setback, Kozole felt it was his duty to document the plight of refugees. "On Friday, I called Matjaž, and we drove to the border the next day. We waited for three hours but nothing happened. A journalist working for the Associated Press told us that the situation is confusing, to say the least: some of the refugees were bussed, some of them travelled on foot, and some of them were denied entry at the border. Helicopters were flying overhead – it was like martial law had been declared. We started recording, and we got about four hours of film in the can. I felt that was enough," Kozole mused aloud. October 24th is a day etched into the minds of both Kozole and Mrak. "After we shot the footage, we went to see the Brežice refugee camp. We were surrounded by journalists from Spain, France, Germany etc. It was like Casablanca in 1944. I was born not far from Brežice. I’m from Krško, and because we have no hospitals there, we are born and we die in Brežice. When all of a sudden the whole world converges on the small town of Brežice, you realize that we’re all connected. Art is not latent, we’re all part of one and the same world," concluded Kozole. Ana Jurc, Translated by D.V.